Most people are aware that October is Breast Cancer Awareness Month, but it is also Liver Cancer Awareness Month. Liver cancer is the second leading cause of cancer death worldwide. While it rarely affects children, awareness campaigns like Liver Cancer Awareness Month can be a great opportunity to teach children more about the healthy choices that can reduce their future cancer risk. Since it is possible for children to develop liver cancer, October is also an important time to learn more about the signs and symptoms of liver cancer in children. Liver cancer is rare in children and teenagers, but it can happen. The two main types of liver cancer in children are hepatoblastoma and hepatocellular carcinoma. Hepatoblastoma typically occurs in children younger than 3, while hepatocellular carcinoma usually affects older children and teenagers. The symptoms of liver cancer often appear when the tumor has grown large enough to be noticed. 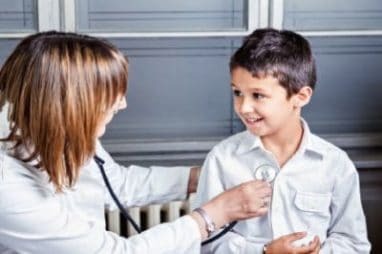 In children, be aware of any lump or swelling in the abdomen, weight loss for an unknown reason, loss of appetite, nausea and vomiting, and early puberty in boys. If you suspect any of these symptoms, it’s important to have them checked out by a doctor for further testing. The risk factors for liver cancer in children differ some from the risk factors in adults. The risk for hepatoblastoma increases if a child has: Aicardi syndrome, Beckwith-Wiedemann syndrome, familial adenomatous polyposis, glycogen storage disease, Simpson-Golabi-Behmel Syndrome, a very low birth weight, or genetic changes such as Trisomy 18. The risk for hepatocellular carcinoma are: Alagille syndrome, glycogen storage disease, having a hepatitis B infection passed from mother to child at birth, progressive familiar intrahepatic disease, or tyrosinemia. In adults, cirrhosis, heavy alcohol use, chronic viral hepatitis, obesity and type 2 diabetes are several of the major risk factors for liver cancer. Men are more at risk for liver cancer than women. Certain races and ethnicities including Asian-Americans and Pacific-Islanders, American-Indians, Alaska-Natives, Hispanics and African-Americans tend to have a higher risk for liver cancer. Many of the risk factors for liver cancer and other cancers are unavoidable, but others like obesity, tobacco, and alcohol use are easier to control. It’s never too early to start teaching children how obesity and tobacco and alcohol use can impact their future health. Tobacco use, diet, physical activity, and body weight all play a major role in cancer risk. You can make a positive difference in the life of a local child when you donate your car to Wheels For Wishes benefiting Make-A-Wish. The proceeds from your tax deductible car donation will go to your local chapter of Make-A-Wish, helping them grant more wishes for children facing critical illnesses. Wishes bring more hope, strength and joy to children when they need it most. Your car donation can help make that possible! To donate your vehicle, please call 1-877-431-9474 or fill out an online car donation form. Every donation makes a difference!